Port wine is one of Portugal’s biggest and most popular exports but, although a lot of us have drunk it at least once, very few people know much about it. It’s often served around Christmas, alongside a cheeseboard, but it’s really not something that’s regularly drunk throughout the rest of the year. In fact, Port has a bit of a stuffy imagine. It’s something that many people associate with their grandparents, who usually have a half-drunk bottle sitting in the back of the cupboard. Hopefully, this article will change your perception of Port. One of the biggest reasons that Port is so underrated is that most people have only tried a very basic bottle of Ruby or Tawny Port from the supermarket, the two types that are most commonly available. These bottles are always perfectly drinkable, but they’re rarely exceptional enough to make you rush out and buy another bottle. To fall in love with Port, you really need to have tried a good bottle. This doesn’t necessarily have to be an expensive vintage Port: a Late Bottled Vintage (LBV) in the €10-20 price range is usually enough to make anyone a Port lover. Did you know that Port wine was invented by accident? At least, that’s how the story goes. Back in the 17th and 18th centuries, Britain was at war with France and was looking for another wine supplier. Portugal, a longtime ally of Britain, put itself forward and signed the Methuen Treaty which stated that Portuguese wine imported in the UK would have lower tariffs than French wine. Lower costs and a desire to boycott French wine meant that demand for Portuguese wine soared in Britain. To increase the chances of the wine surviving the trip to Britain, wine producers in Portugal began adding a little aguardente (a type of brandy) to fortify the wine. Doing this, actually changed the taste and makeup of the wine. It meant that the wine was higher in alcohol, sweeter, and more robust. Basically, doing this created Port wine. Port wine or Oporto wine became a huge success over in Britain, and soon wine producers actually began making Port on purpose. Port houses established themselves in Vila Nova de Gaia, on the banks of the Douro River opposite Porto and, the rest as they say, is history. These days, Portugal isn’t the only country that makes Port. Port is actually made in several other countries around the world, including Australia, South Africa, and the United States, but EU laws restrict the term Port from being used. Along with high tariffs, this means that non-Portuguese Port wine is very rare within Europe. And, this being a blog about Portugal, we’re really only interested in discussing Port wine from Porto. The initial process of making Port wine is fairly similar to making table wine: grapes are grown in the Douro Valley near Porto, then harvested, and then pressed. The most commonly used grapes are Touriga Nacional, Touriga Franca, Tinta Roriz (aka Tempranillo), Tinta Barroca, and Tinta Cão, but there are more than 52 different grapes that can be used. The pressed grapes, along with the stems, seeds, and skins are left to ferment until alcohol levels get to around 7%. The key difference between Port and normal table wine is that aguardente (a type of brandy) is added to the fermenting grape juice after several days which kills the fermentation process, increases the alcohol levels to around 19-21%, and means there is a lot of residual sugar left over. The Port is then put into large oak casks for around 18 months, after which it will be assessed. During the assessment, the Port house will decide what type of Port the wine will eventually become. Of course, the Port house will know in advance what they want to make. If the grapes are high quality and from a single harvest, for example, they’ll be expecting to make a fine Port like an LBV, a Vintage Port, or a Colheita. Most supermarkets, and even wine shops, only usually stock a few different types of Port wine: usually a Ruby and a Tawny, and maybe a bottle of Vintage Port as well. There’s more to Port than just these three styles as you’ll soon see. But, although there are a lot of different styles, most fall under either the category of Tawny or Ruby. A vintage Port, for example, is a Ruby Port (but a really good quality one). Whether the harvested grapes end up becoming a Ruby or a Tawny depends on how the wine is initially aged: Ruby Port is initially aged in tanks, usually stainless steel or concrete, while Tawny Port is aged in barrels. This decision produces two completely different styles of Port that have very different colours, flavours, and aromas. Within those two categories, there are a number of different sub-categories. Depending on the quality of the harvest, along with the Port House’s own decisions, the Port may be aged further to produce a higher quality style of Port. 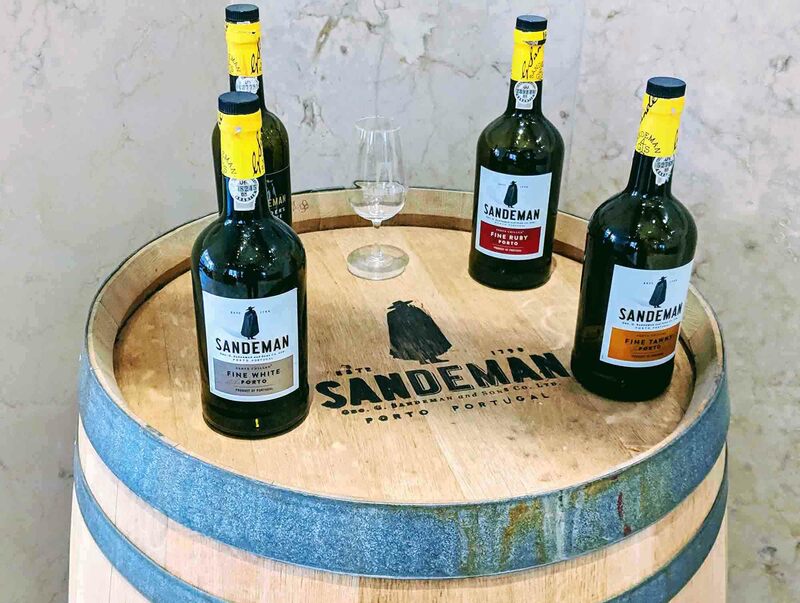 White Port is usually considered to be in its own category as it uses different grapes to Red Port, but the process for making White Port is the same as Red Port. White Port is normally not aged for very long, and is normally broken down by sweetness, but you can find a few aged White Port as well. Ruby is a basic Port wine, and the most extensively produced style of Port. It’s usually fairly cheap, and typically around 3-5 years old. It matures in concrete or stainless steel tanks, and is usually a blend of different years. Ruby Port has a rich ruby or claret colour, fruity aromas, and fresh fruit flavours. The flavours are simple and nowhere near as developed as an older vintage bottle of Port, but are pleasant nonetheless. Most people serve Ruby Port in a Port wine glass at room temperature, but it can also be served slightly chilled in warmer weather. Some people even serve it over ice. Rosé Port was first made by Croft in 2005, and so it’s very much a recent invention. It hasn’t been hugely successful, despite a lot of marketing, and only a few Port Houses make a Rosé style Port. It comes under the Ruby category, but it’s fermented in a very similar way to a rosé wine: the wine barely touches the grape skins, and so has a very pale colour. It’s normally quite fruity, and it’s designed to be an easy-drinker that’s served chilled or over ice. Based on the marketing, which is very female-focused, it’s something that’s meant to be drunk by the pool. Reserve Port (originally called “Vintage Character” Port) is made by blending a variety of vintages, all of which normally have an average age of between 5 and 7 years. Like Ruby Port, it’s fruit forward but it has more complexity than a standard Ruby as it spends more time in barrel. A Late Bottled Vintage (normally just called an LBV) has many of the same characteristics of a Vintage Port, but at a fraction of the price. Port makers achieve this by leaving the Port in barrel for longer (around 4-6 years typically) rather than letting it age in the bottle. This technique is pretty effective. It’s impossible to completely mimic a Vintage Port, of course. The LBV is lighter-bodied, and doesn’t have the same complexity, but it’s still a great bottle of Port. If you drink both you’ll be able to tell the difference, but for the price it’s a very good imitation. It isn’t just a case of extensive barrel aging. The grapes used in an LBV come from a single harvest, and are usually of good enough quality to become a vintage Port. You’ll come across both filtered and unfiltered LBVs. Sometimes the wine label will say, but often you can tell by the cork: plastic-topped stoppers usually mean a filtered LBV. An unfiltered LBV will need decanting. There are “hacks” where you can decant without a decanter but, if you don’t have one, it’s much easier to buy an LBV that’s already filtered. Most LBVs are ready to drink straight away, but an unfiltered LBV can improve with bottle aging if you want to store it. Filtered LBVs generally don’t improve with bottle aging. Crusted is the next step up between LBV and vintage Port. Price-wise, it’s quite a big step and Crusted Port can actually be very hard to find as well. It’s not the nicest name for a wine, and some people might be put off by the name, but it’s an accurate name: this Port has a deposit or crust that forms on the walls of the bottle. Naturally, given the crust, this wine needs to be filtered so make sure you have a decanter before opening the bottle. Vintage Port is considered to be the best type of Port that you can buy. It isn’t produced every year: normally there are around 3 harvests per decade as Vintage Port can only be made from the very best grapes. The grapes usually come from different vineyards, but they always come from the same year. Although only some years are good enough for vintage Port, some years are better than others. If you’re thinking of buying a vintage Port, it’s a good idea to read up on the year to see how good Port experts think it is. Wine Spectator and For the Love of Port both have guides to the different Port years. Vintage Port is aged in barrels for around 2-3 years before bottling. Strict laws prevent Vintage Port from being barrel-aged for any longer. Vintage Port is always unfiltered, and can continue to mature for another 20 years or even longer once bottled. This, of course, means that it will need decanting and a little time to breathe before it’s ready to be properly appreciated. Single Quinta Vintage Port (SQVP) is a specific type of vintage Port, and it signifies a Vintage Port that’s made from the grapes of a single estate (quinta). It’s not commonly produced, and it can be quite hard to get your hands on a bottle. While Ruby Port is aged in tanks and maybe in bottle as well, Tawny Port is aged in barrels. It is much lighter than most Ruby Ports, especially Vintage Ports. It has a rich, amber colour, and flavours of caramel and nuts and, if it’s aged for longer, flavours like dates and prunes. In comparison to Ruby-style Ports, which normally have fruit flavours, this is a very different flavour profile. This indicates a Tawny that has spent around 7 years in oak. A Tawny Port with Indication of Age is a Tawny that’s 10, 20, 30, or over 40 years old. The age doesn’t mean a single vintage: a Tawny is usually a blend of several different wines, and usually those wines come from several different years. The age is also normally a very loose calculation rather than an average, and is more based on taste than anything mathematical. Unlike Vintage Port, Tawny doesn’t really continue to mature in bottle and is usually ready to drink straight away. Tawny is often served chilled, and sometimes over ice. This includes both basic Tawny Ports and even aged Tawny Ports. There is no need to decant Tawny Port, and this also means that a Tawny Port can be left open for a lot longer (a month or more). Colheita is the Portuguese word for harvest, and it’s a type of Tawny Port where all of the grapes come from a single year. It is aged in barrel for a minimum of 7 years, but many will spend a lot a longer in wood than that. Take the time to read the label as there are two dates you’re looking for: the vintage year and the year it was bottled. The bigger the gap between the two, the more interesting those flavours will be. While Tawny and Ruby Port are made from red grapes, especially Touriga Nacional, Touriga Franca, Tinta Roriz (aka Tempranillo), Tinta Barroca, and Tinta Cão, White Port is made from white grapes. The most commonly used white grapes like Códega, Malvasia Fina, Gouveio (Verdelho), Rabigato, and Viosinho. There are actually several different styles of White Port, which indicate sweetness: Extra Seco, Seco, Doce, and Lágrima. All are normally fruity and the sweetest style, Lágrima, is incredibly sweet. The younger non-reserve Ports are often served as aperitifs, and they’re used for cocktails like Port and tonic. White Port is typically bottled young, but it is possible to find aged White Ports as well. The aging categories are very similar to Tawny Port, so you’ll find Reserve, 10, 20, 30, and 40-year-old White Ports. Port wine is normally served in servings of around 85 ml (3 oz) in a Port wine glass, which is narrower than a normal wine glass. Depending on the Port style, it can be served at room temperature or chilled. Some Port, particularly Vintage Port, needs decanting. You can usually tell if a Port needs decanting if it has the word “unfiltered” on the bottle or, failing that, by the cork. The plastic topped easy-to-open corks usually signify a Port wine that has already been filtered, while unfiltered Ports will need to be opened with a corkscrew. Remember: Port that has been decanted will oxidise quickly, and will need to be drunk within a day or two. For most Port lovers, that’s never a problem. Tawny Ports and cheaper Ruby Ports will last longer, and can keep for up to a month at a time. Most Port is designed to be drunk straight away rather than stored. The only Ports that really improve with aging are Vintage Ports, Single Quinta Vintage Ports, Unfiltered LBV Ports, Crusted Ports, and certain Colheitas. Again, look for the words unfiltered or a cork that needs to be opened with a corkscrew. Both of these are indicators of a Port that’ll continue to mature in the bottle. If you do decide to store Port, keep it in a cool and dark environment and store it on its side. A cellar is the ideal location, but really you’re looking for somewhere that’s not going to get hot and won’t have fluctuations in temperature.